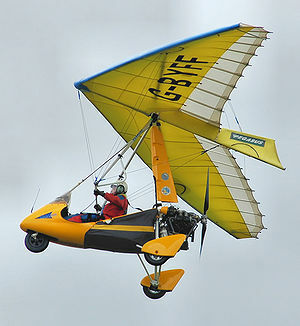 The Pegasus Quantum is a British two-seat, ultralight trike that was designed and produced by Pegasus Aviation and later by P&M Aviation. The Quantum production was ceased in 2012, but full spares and support are still available and will remain so for the foreseeable future. The Quantum was intended as an up-scale touring trike for long distance flying. The base model, without a cockpit fairing and powered by the Rotax 503, twin cylinder, two-stroke, air-cooled engine of 37 kW (50 hp). Standard equipment when delivered included in-flight trim, all-wheel suspension and brakes. The mid-model, which adds an instrument pod, wheel pants, a retractable wing-mounted pylon with a gas strut, pylon fairing, extra stowage and powered by the Rotax 582, twin cylinder, two-stroke, liquid-cooled engine of 48 kW (64 hp). The high-end model, which adds a full cockpit fairing, windshield, additional stowage and powered by the Rotax 912, four cylinder, four-stroke, liquid-cooled engine of 60 kW (80 hp).